South Western senior Lynne Mooradian picked up four more first-place medals at Friday's meet. Ten years from now, Lynne Mooradian may still be a part of the YAIAA track and field championships. 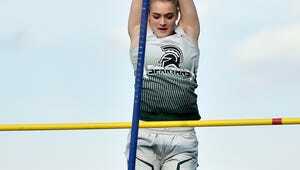 She won't be competing for South Western anymore, and her college career at the United States Military Academy at West Point will be long over, but her name may still ring throughout the field wherever the meet takes place. The announcers call out the meet record before every event, and the Mustangs senior set two records on Friday that will be tough to break: 14.53 seconds in the 100-meter hurdles, and 44.39 in the 300 hurdles. When people hear her name, they'll remember how she dominated this meet for four years: She won 14 first-place medals in her four years, and she might have won the maximum-possible 16 if not for a dropped baton in a relay her freshman year, and the decision to scratch from the 400 dash to rest her legs for that relay. But as she pondered her legacy with medals around her neck on Friday, she realized those records will remind people of even more. Mooradian's other two victories Friday night came in relays, as she anchored South Western to wins in the 400 and 1,600 relays. 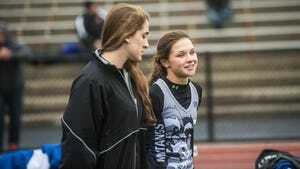 She plans to compete in the same four events next weekend at the District 3 championships. The next two weeks will be all about improving her hurdling times and preparing herself and her teammates for districts. Teammate Sammy Trone, who runs the first leg of both relays, ran a personal-best 58.29 to win the 400 dash and surpass the district qualifying standard in that event. But when the season ends, Mooradian can look back and appreciate the 14 medals she's earned at the YAIAA championships.